The Leeds Convention of 3 June 1917 has been described by Ralph Miliband as ‘perhaps the most remarkable gathering of the period.’ The description seems to be a fair one. 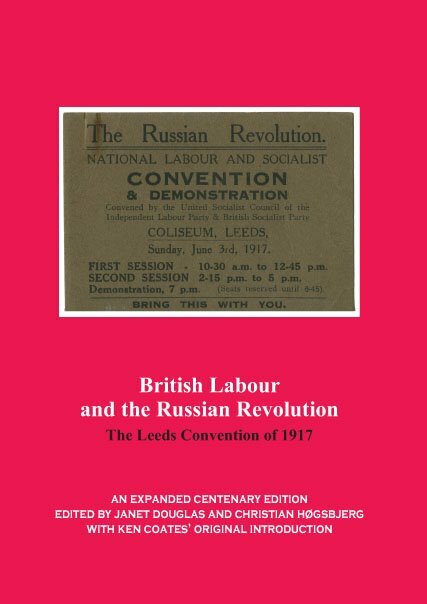 On the one-hundredth anniversary of the Russian Revolution and the coming together of the many and varied strands of the British labour movement at the Leeds Convention, Spokesman is pleased to re-publish ‘British Labour and the Russian Revolution’ with additional materials. To celebrate the centenary of the Leeds Convention Janet Douglas and Christian Høgsbjerg have brought together the calling notices, reports from the convention and responses to its motions. The pamphlet allows an insight into the excitement caused by the Russian Revolution and the debates that it created inside the British working class. The pamphlet also draws on the excellent new resource that Warwick University has created with its digitalisation of many documents from the period. Pete Jackson, Socialist Review 425 (June 2017. There was a special event organised by the Ford-Maguire Society and Leeds TUC with the support of the Lipman-Miliband Trust on 3 June 2017 at the Swarthmore Centre in Leeds to commemorate this event – for more details please see here.